Peruvian Ceviche is an absolute classic. It can be made in a few different ways, but ultimately is all about fresh, raw fish as the headline ingredient. This is perhaps the most well known Peruvian dish. Often it is made with anchovies like the version below. However traditionally this would have been made with sea bass. Ceviche ultimately is about the “cooking” of the fish in the citric acid present in the lime juice, which changes the fish’s texture from soft and semi-transparent to firm white fish meat. The art is to balance all the flavours, all of which are powerful and yet necessary for the intensity. Coupled with plain crackers and salad makes this a refreshing and summery dish enjoyed around the world. Remove the back bones from the anchovies if they are present. Finely chop the celery and the green chilli, coriander and garlic as much as possible. Cut the red onion into very thin strips. Mix all the ingredients above (except the anchovies) with the lemon remaining ingredients and mix well to ensure the sugar and salt etc has dissolved. Add the anchovies and mix gently to avoid breaking the fish and leave for 10- 15 minutes before serving. 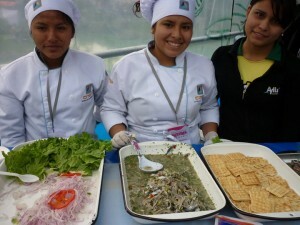 Serve the ceviche in lettuce leaves and eat with the salt biscuits.